A reproduction of the Duncan "Crossed-Flags" Tournament that was popular in the early 60s. 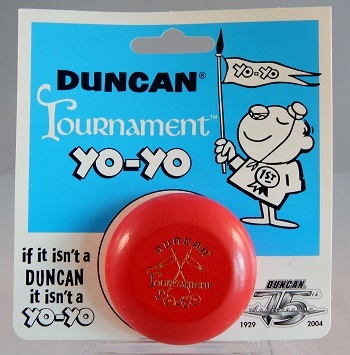 The yo-yo was made to celebrate the 75th Anniversary of Duncan Yo-Yos. Unlike other yo-yos of the time that were made from two wooden halves glued to a wooden axle, this yo-yo model was constructed from one piece of wood. It was manufactured by Elfverson of Sweden. Elfverson is the second oldest manufacturer of wooden yo-yos (I think since 1932) next to Duncan. They manufactured many of the popular yo-yos used in the past 50 years for such famous names as Cheerio, Royal, Festival, Canada Games and others. Yo-yo is mounted on a reasonably close reproduction of the card on which the yo-yo was originally sold. These reproductions came in natural, solid colors, and solid colors with white stripes. Each has a gold stamp of the original logo design. See two original models here: Duncan Tournament - No. 77 B, and Duncan Tournament - No. 77.